Yaser Kasim netted an 89th-minute winner as Swindon came from behind to beat Sky Bet League One promotion chasers Bolton 2-1 at the Macron Stadium. Iraq-born Kasim fired home at the far post from Charlie Colkett's cross to end Town's run of seven league and cup games without victory. Third-placed Wanderers had gone in front three minutes after the interval with a stunning goal from an unlikely source. Centre-half David Wheater smashed home a superb volley from Jay Spearing's corner for his fourth goal of the campaign. 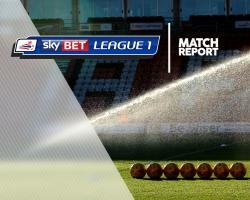 Top scorer Zach Clough was denied by keeper Lawrence Vigouroux in the first minute while Wanderers were convinced a foul by Raphael Rossi-Branco on Gary Madine merited a penalty. James Henry, with one of two attempts to hit the woodwork, almost doubled Bolton's advantage after 57 minutes. But Swindon rallied in the final 25 minutes as Ben Gladwin marked the first game of his third spell by equalising with a deflected shot from the edge of the area. Henry struck the post for a second time for the Trotters before Swindon broke in the final minute to complete a double over the Trotters after a late smash-and-grab in the reverse fixture last October.